Topical pain management therapeutics are specialty products that are used to relieve acute musculoskeletal pain or general sprains or strains. The therapeutics involve various drug classes such as analgesics, anesthetics, and skeletal muscle relaxants. Topical pain relievers are becoming increasingly popular in sports category owing to their site-specific action, cost-effectiveness, instant pain relief, and availability in the OTC segment. These are available in the form of gels, sprays, creams, and patches. The global market for topical pain management therapeutics in sports medicine was worth US$ 1,400.0 Mn in 2016, with analgesics therapeutics class dominating the overall global market. The global topical pain management therapeutics in sports medicine market is witnessing a significant growth and is expected to expand at substantial CAGR during the forecast period of 2017–2025. Rise in demand for cost-effective and instant pain relief therapeutics by national and international sports players, introduction of novel pipeline product, emergence of online platform for the topical therapeutics, improved distribution of the pain relief therapeutics in developing countries etc. are some of the factors driving the growth of global topical pain management therapeutics in sports medicine market. The global topical pain management therapeutics in sports medicine market is segmented on the basis of product, therapeutic class and regions. Based on the product type, the gel segment accounted for over 40% share in terms of value of the global topical pain management therapeutics in sports medicine market, in 2016. The segment is anticipated to dominate the global topical pain management therapeutics in sports medicine market throughout the forecast period due rise in number of local players offering cost effective gel formulation for pain management. Based on the therapeutic class, the global topical pain management therapeutics in sports medicine market is segmented into analgesics, anesthetics and skeletal muscle relaxants. Analgesic segment is expected to hold the highest share of the market during forecast period of 2017–2025 due to shift of patient’s preference toward topical therapeutic treatment for acute injuries due to the inconvenience associated with oral drugs. Lack of awareness towards pain management in many developing countries, high cost of medicine, unavailability of specialty products in developing countries, etc. are few of the factors restricting the growth of the global topical pain management therapeutics in sports medicine market. Furthermore, rise in patient preference for pain management devices in treatment of sports injuries is affecting the growth of the topical pain management therapeutics in sports medicine market in many regions. Geographically, North America and Europe are the regions where largest revenue is generated for the global market. The U.S, U.K and Germany show high adoption rates for topical pain management therapeutics as compared to rest of the world due to rise in number of sports injuries in U.S, approval of novel products from US FDA, increase in sports participation in Europe developed healthcare infrastructure, high prevalence of the disease in the region etc. Topical pain management therapeutics in sports medicine market in the Asia Pacific is set to expand owing to proactive initiatives by governments encouraging adolescents' participation in sports activities. Developed countries such as Australia and Japan are favorable for the growth of the market. Rise in sports participation from the region, government initiatives from countries like China and India etc will further drive the market in Asia Pacific. Some of the key players in the global topical pain management therapeutics in sports medicine market include Teva Pharmaceutical Industries Ltd., Pfizer, Inc., Hisamitsu Pharmaceutical Co., Inc., Mayne Pharma Group Limited, Sanofi (Chattem, Inc.), GlaxoSmithKline plc., Endo Pharmaceuticals Inc., Beiersdorf AG, Johnson & Johnson Services, Topical BioMedics, Inc. High efficiency and efficacy of therapeutics with minimum side effects will have a major impact on global topical pain management therapeutics in sports medicine market. This report on the global topical pain management therapeutics in sports medicine market analyzes the current and future prospects of the market. The report comprises an elaborate executive summary, including a market snapshot that provides overall information of various segments and sub-segments. The research is a combination of primary and secondary research. Primary research formed the bulk of our research efforts along with information collected from telephonic interviews and interactions via e-mails. Secondary research involved study of company websites, annual reports, press releases, stock analysis presentations, and various international and national databases. The report provides market size in terms of US$ Mn for each segment and sub-segment for the period from 2017 to 2025, considering the macro and micro environmental factors. 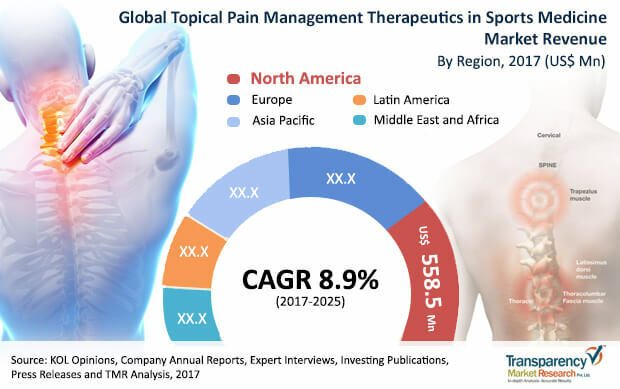 Growth rates for each segment within the global topical pain management therapeutics in sports medicine market have been determined after a thorough analysis of past trends, demographics, future trends, technological developments, and regulatory requirements. A detailed qualitative analysis of factors responsible for driving and restraining market growth and future opportunities has been provided in the market overview section. This section of the report also includes market attractiveness analysis that provides a thorough analysis of the overall competitive scenario in the global topical pain management therapeutics in sports medicine Market. Market revenue in terms of US$ Mn for the period between 2015 and 2025 along with the compound annual growth rate (CAGR %) from 2017 to 2025 are provided for all the segments, considering 2016 as the base year. Market size estimations involved in-depth study of product features of different types of products. Additionally, market related factors such as rise in preference for topical therapeutics, rising sports injuries, projected launch of the products etc. in various geographies and historical year-on-year growth have been taken into consideration while estimating the market size. Topical pain management therapeutics are specialty products that are used to relieve acute musculoskeletal pain or general sprains or strains. The therapeutics involve various drug classes such as analgesics, anesthetics, and skeletal muscle relaxants. Based on product, the global topical pain management therapeutics in sports medicine market has been segmented into gels, cream, sprays and patches. The patches segment is further segmented into drugs in adhesives, matrix, reservoirs and others. The gel segment is anticipated to hold a significant share of the global market. The segment is projected to dominate the market during the forecast period due to the local players offering cost effective novel gel formulation. Based on therapeutic class, the global topical pain management therapeutics in sports medicine market is segmented into analgesics, anesthetics and skeletal muscle relaxants. The analgesics segment is further divided into opioids and non-opioids. The opioids are further classified into fentanyl, buprenorphine and others, while the no-opioids are further segmented into lidocaine, diclofenac, capsaicin, methyl salicylate and others. The analgesics segment is anticipated to dominate the global market throughout the forecast period owing to shift of patient preference from oral drugs to topical analgesics. Geographically, the global topical pain management therapeutics in sports medicine market has been segmented into five regions: North America, Europe, Asia Pacific, Latin America, and Middle East & Africa. In addition, the regions have been further segmented by major countries from each region. The report also profiles major players in the topical pain management therapeutics in sports medicine market based on various attributes such as company overview, financial overview, SWOT analysis, key business strategies, product portfolio, and recent developments. Key companies profiled in the report include Teva Pharmaceutical Industries Ltd., Pfizer, Inc., Hisamitsu Pharmaceutical Co., Inc., Mayne Pharma Group Limited, Sanofi (Chattem, Inc.), GlaxoSmithKline plc, Endo Pharmaceuticals Inc., Beiersdorf AG, Johnson & Johnson Services, Inc., and Topical BioMedics, Inc.